Chakra colors reflect different frequencies of light and energy associated with each energy center. By decorating your meditation room or corner, you can be inspired by the chakras colors. Red chakra color: Red is the color of the root chakra, which is situated at the base of the spine and is chakra vibrating at the lowest frequency, i.e., the slowest of our seven chakras. Red chakra color symbolizes safety, survival, the physical body is linked to the earth. Hot or cold, you can use the pad inside the waistband as a point heaters for stomach or back end or as soothing pressure over eyelids without being heated or cooled. Orange is the color of the sacral chakra, located about three finger widths below the navel and have significant feelings, creativity, sexuality, flow linked to water. 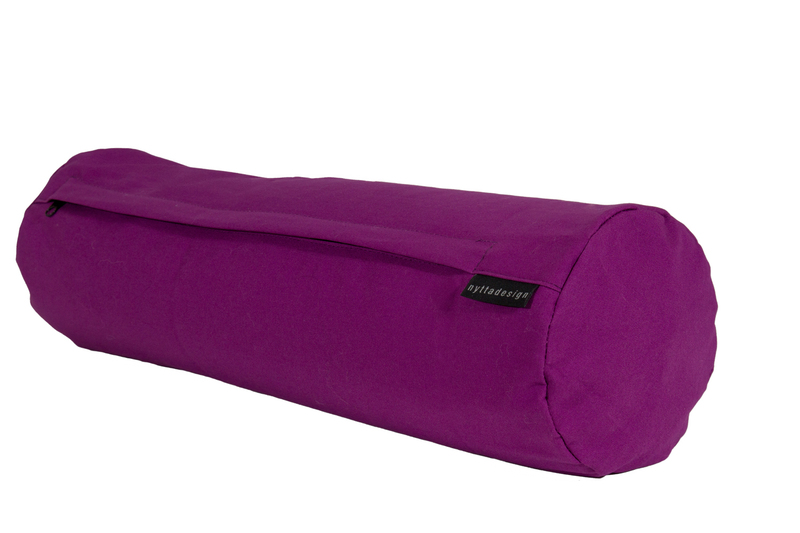 A larger cylinder pillow / yogabolster 60 cm long and 20 cm in diameter. Use as a meditation cushion, for neck or knee. The muscles of the pelvis and spine relaxes easier when the knees are slightly bent with a cylinder cushion support, use when you are lying in bed or on the floor. Located above the navel we find the Solar Plexus Chakra represented by the color yellow symbolizes mental activities, intellect and personal power. Green is the color of the heart chakra and is connected with love, inclusion and compassion. The color of the throat chakra is blue and symbolizes self-expression, the expression of truth, creative expression and communication. A bean-shaped meditation cushion suitable for the lotus and half-lotus position. The cushion indentation provides space for the heel, it also provides support for the upper thighs. In between the eyebrows, we find the third eye, which has the color purple (or deep indigo blue) and awakens intuition and inner wisdom. White is the color of the crown chakra, located at the top of the head and symbolizes the universal connection of spirituality, consciousness. The colors are not necessarily a given, set point, but rather reflects the activity of energy centers and their frequency or vibration. Take a look around you and begin to associate the colors you see with the importance of chakras colors. By decorate consciously, you can give your meditation deeper meaning and insight into your experience.